To stop adding comments to old posts, here’s a small update as a full-fledged post. Despite my temporary commitment to Panda Internet Security (for its features called Data Shield and Application Control) for my Windows 10 laptop, I’ve run into this problem: on a 64-bit Windows 7 Professional system, the trial edition wasn’t recognized by the system as a valid security solution, and Windows insisted on using Windows Defender and MSE (which happened to be installed). Not being eager to investigate that particular Windows 7 installation (it was an enterprise setup), I looked for a quick alternative. For what it’s worth, my safe alternative still is either of KAV or KIS. I had a stub that installed a 3-month trial of KAV in French, but now it installs a 50-day license of KAV 2017. By removing the app while preserving the license, other localisations of KAV would inherit the longer trial period after running the normal trial Setup–I tried with the German edition. On various sites (I don’t trust Amazon for software licenses, they might be locked on North America), the offers are better: Kaspersky Internet Security 2017 for 13.49 €, as compared to Kaspersky Anti-Virus 2017 for 14.80 €. A nominally much better choice just popped up in the form of a special CHIP license for a new product called Kaspersky Security Cloud (Personal), currently available in Germany and in the UK. The single-DVD (5.80 €), double-DVD (7.40 €) and digital bundle (6 €) editions of CHIP 8/2017 all include a free 1-year license (“a 69.95 € value”), in the annoying way CHIP licenses work: the first activation is for 183 days, then you have a 10-day time frame to enter the license code (the code given by Kaspersky, not the code from the magazine) to add another 6 months. But I installed the trial edition and the program wouldn’t provide any protection of all unless the user creates a Kaspersky account and authenticates from within the app! Pure garbage–uninstalled right away. I just want a security solution that works based on a license code, full stop. So the choice is back to KAV or KIS. I tend to prefer KAV, to keep it on the lighter side, despite most of the offers being for KIS, KTS or whatever hyperinflated crap they have in store (now KSC). And there is the 2018 (18, actually, because 2017 is version 17) line of products almost released, only not in stores yet. Would a 2017 license work with a 2018 product? Most likely not, but nobody could tell. Waiting for version 18 to show up in stores, I found some 91-day OEM licenses that work with KIS and KAV from 2014 to 2018, and I applied one over KAV 2018 (taken from Kaspersky’s FTP server). The crappy KIS 2018 was not a stub, but the full program, and it failed to install, claiming that I need .NET 4.0 or 4.5 (4.7 was already installed). Lucky me, their full KAV 2018 Setup just worked. In the past I was able to uninstall KAV/KIS and clean the system (without using a trial resetter!) so that a 3-month trial would work again on a reinstall, but it’s too much of a trouble (and I’m not sure it would work with these OEM licenses). For the time being, I have 3 months to wait for the 2018 line to be officially released and to hunt for a convenient coupon. UPDATE: Eugene Kaspersky has posted on July 25: KL AV for Free. Secure the Whole World Will Be, announcing the global launch of Kaspersky Free! The roll-out won’t be fully global instantaneously; it’s going to be done over four months in waves as per different regions. The first wave will be the U.S.A., Canada, and many of the Asia Pacific countries. September: India, Hong Kong, Middle East, Africa, Turkey and Latin America. October: Europe, Japan and South Korea. November: Vietnam and Thailand. If we compare the GUI of KFA 2018 to those of KAV 2017 or KAV 2018 and KIS 2017 or KIS 2018, we notice that KFA 2018 is using the GUI of KIS, not the GUI of KAV, while showing as disabled those features only available in KIS (also in KTS). This is a marketing approach meant to show you how much more you’d get once you purchase a license. 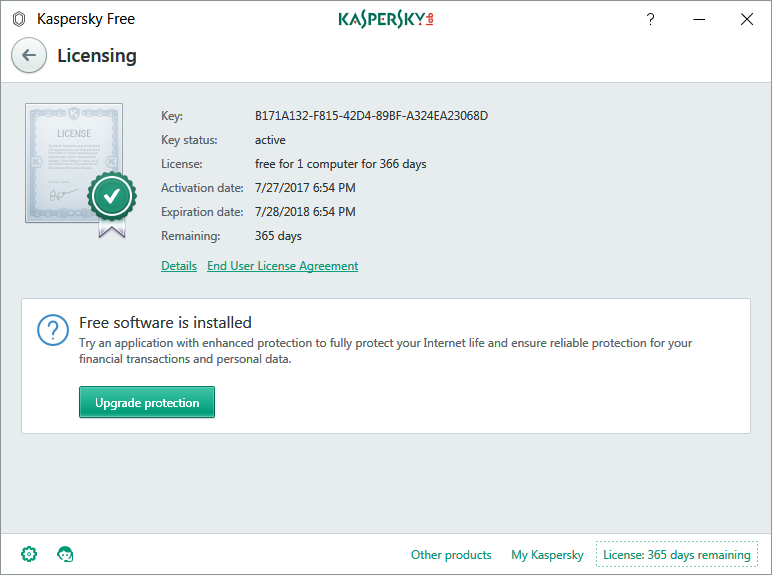 Either way, the bottom line is that Kaspersky Free Antivirus 2018 (18.0.0.405, English UI) is already available to everyone, just not mentioned on the national sites until it’s officially launched in the respective region; and that its protection is inferior to that offered by Kaspersky Anti-Virus. I don’t know what happens after the first year of free usage; the initial idea of launching a free version was that after one year the user is supposed to start paying. If this is the case, I expect the user will be asked to pay for a KIS license, not for a KAV one, as the GUI is definitely belonging to the KIS line, with disabled components. Page 6: Additional features/support in cheapest paid product: Technical support; system watcher (stops malware by behaviour analysis and reverses malware changes). Page 38: We could not find a feature comparison of the two programs on the Kaspersky Lab website (only a comparison of Kaspersky Free vs Kaspersky Internet Security). Kaspersky a aussi au moins Application Control, je crois… (voir la troisième image ici). Non, elle est grisée. I’ve updated the post with details on Kaspersky Free. Kaspersky went down, and Microsoft went up: in AV-Comparatives’ Real-World Protection Test – July 2017, they both had the same score! 0.3% compromised: Bitdefender IS, AVIRA Pro, eScan, BullGuard, Kaspersky IS, Microsoft. 0.3% user-dependent: Kaspersky IS, Microsoft. And, no kidding, all these products were 100% effective?! 100% blocked: Panda Free, Avast Free, AVG Free, TrendMicro, Tencent, Symantec, F-Secure. Everything with the default settings (factsheet). Trend Micro is among the growing number of security utilities that includes components devoted to ransomware protection, and it attacks the problem in several different ways. 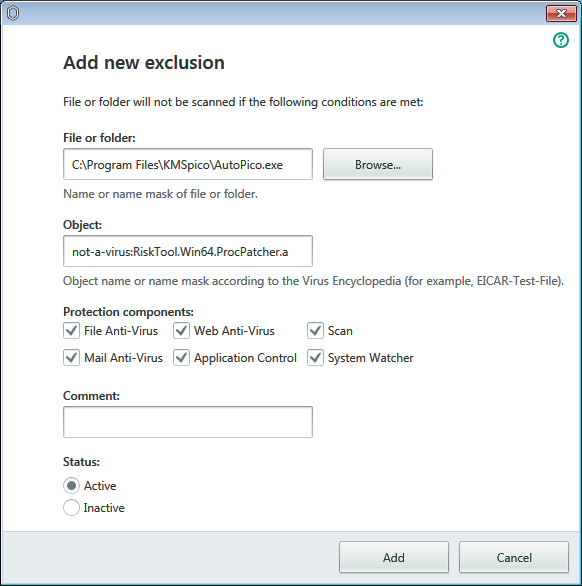 To start, the Folder Shield component blocks all access to protected files by any program that isn’t on the trusted list. By default, it protects the files in and below your Documents and Pictures folders, as well as the local folders representing online storage services such as Google Drive, OneDrive, and DropBox. That’s an improvement over the previous edition, which limited protection to a single folder, Documents by default. Bitdefender and Panda Internet Security also let you protect multiple folders; Panda even denies read access for unauthorized programs. Trend Micro goes further by extending protection to files on USB drives. Of course, it can’t protect those files after you unplug the USB device. By default, Panda protects the Documents folder for each user account on the system. Bitdefender defaults to protecting Documents, Pictures, Videos and Desktop for each account. Folder Shield, on the other hand, can’t access folders belonging to other user accounts. Worse, if you log in to a different user account and try to configure Folder Shield, you end up wiping out existing protections. This feature is ill-suited for use on a multi-user PC. When you edit a file with a trusted program, Folder Shield stays out of the way, but any modification attempt by an unknown program triggers a warning. 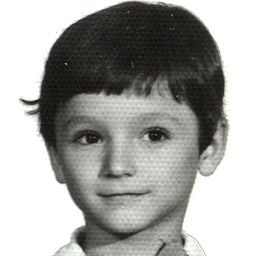 If you’ve just started to use, say, a new photo editor, you simply click to trust it. But if you don’t recognize the program, either click to block it or wait a short while for Trend Micro to block it automatically. In testing, it successfully detected my attempts to edit files with a thoroughly off-brand text editor; it also resisted my simple, hand-coded file encryptor. In addition to blocking unauthorized access to sensitive files and detecting ransomware based on its behavior, Trend Micro keeps a secure backup of all files in the protected folders. If ransomware does manage to encrypt some of these before the antivirus kills it, the Damage Recovery Engine does its best to restore files from backup. An edition comparison might help. Israeli agents were able to hack into the Kaspersky Lab network in 2014, and observe in real time what the Israeli agents claimed were hackers working for the Russian government searching through the computers of Kaspersky’s 400 million users. Not that I would believe what the MOSSAD says.